Before launching the brand new “On Fire” pottery exhibit, The Rockwell Museum of Western Art sought to create new marketing collateral that would be both compelling & interactive while improving their art labeling system. Crystal McKenzie, Inc., a brand strategy and marketing communications agency based in NYC, was brought on to identify the best solution for communicating, displaying, and encouraging visitor interaction with the detailed information from the 100 pieces on display. Visitors use a touchscreen tablet in an accessible enclosure custom designed by Hadley Exhibits Inc. to view the relevant labels for the item (or items) they are interested in learning more about. Should they prefer to take that information with them, a QR code feature allows them to load the information on their own phone and walk around the museum to view. This mobile use of already-compiled and accessible information illustrates the many opportunities to transition from self-service to mobile to digital signage, and then to web. With integration of information and message across mediums, CMI has created a seamless visitor experience that carries through each visitor contact with the Rockwell Museum’s brand and messaging. CMI’s team consisted of Creative Director Brian Jones, Graphic Designer Paul Kwak and Hadley Exhibits Inc. (hadleyexhibitsinc.com) representative Patrick Caveny. The Rockwell Museum, with the help of Crystal McKenzie, Inc., met its goal to utilize interactive and digital technologies in its galleries to enhance the visitor experience. Active participation, engaging learning experiences, and user-friendly access to information were all achieved with the use of tablet kiosks. The tablets were locked down by KioWare kiosk software and configured to provide access to the content and materials created and provided by the CMI/Rockwell Museum team. 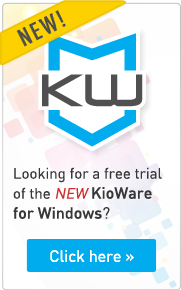 KioWare allows the tablets to function in a locked down mode that restricts the user to only the application or websites that The Rockwell Museum permits. This protects both the user and the device from misuse, ensure privacy, & results in a reliable & innovative experience. Digital solutions provide benefits such as easily updated content, and are both environmentally friendly and saves on printing costs. Users find technology engaging and interactivity to draw interest. Text size can be modified to accommodate a plethora of visual needs. While challenges exist, namely a need for internet connectivity and set up costs, the use of tablets can lower the initial output with wifi providing a portable and reliable connection source. The feedback has been positive since the exhibit’s opening in April of this year. Kristin Swain, Executive Director of The Rockwell Museum addresses the project, “We are focused on providing information in a user-friendly way to our guests. This sleek and contemporary software application provides a platform for The Rockwell to be innovative and creative while enhancing the visitor experience." With great projects like this CMI marketing solution for the Rockwell Museum’s On Fire! Exhibit, it is clear to see that kiosks can be an added tool for use in the wise agency’s toolbox. Utilizing mediums such as kiosks and mobile technology in conjunction with great design and implementation, Crystal McKenzie, Inc. and The Rockwell Museum illustrate that museums can benefit from innovation, providing visitors with an enhanced experience that highlights the museum’s exhibit while maintaining substance, history, and educational value. Read the comprehensive case study written by Alanna Flowers of Crystal McKenzie Inc., here. The On Fire Exhibit will be on display at The Rockwell Museum until April 1, 2016. From The Rockwell Museum’s site, “More than a museum displaying exquisite pieces, The Rockwell is a unique community center where people enjoy, connect, and reflect on the essence of the American spirit, character and values through the eyes of American artists.” Information about this exhibit and others can be found at Rockwellmuseum.org. CMI (cminyc.com) provides signage solutions to help their clients improve their bottom line and increase the value of their products and services. From strategy through implementation, CMI delivers construction project communications, community relations, master wayfinding systems, signage solutions and results. Services include all phases of development including the preparation of requirements and design specifications, preparation of test plans and procedures, workflow management consulting, digital asset management systems, and web-based document delivery systems. Need more help? KioWare has played a role in numerous kiosk projects for museums. Continue reading: Penn State All-Sports Museum Improves Visitor Experience Through Interactive Kiosks and Da Vinci Discovery Center Discovers Kiosks. If you’re looking for innovative ways to have your museum visitors interact with your content on kiosks, check out Interactive Kiosk Uses - 15 Odd, Ordinary & Obvious Kiosk Uses.